A charity auction of 70 individually designed Oor Wullie sculptures has raised £883,000. 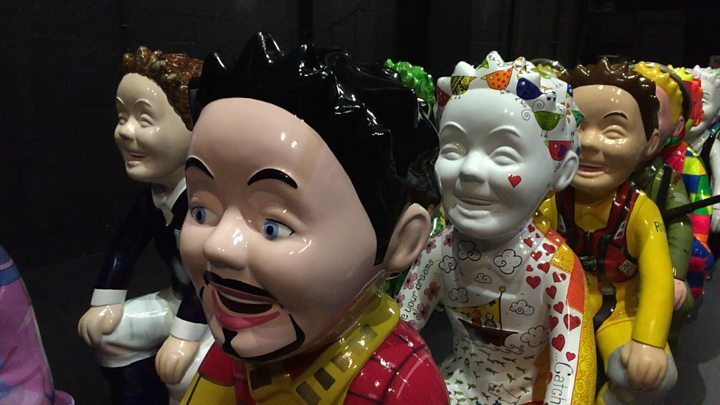 The designs were part of Oor Wullie's Bucket Trail, which saw 55 of the sculptures displayed across Dundee, with the remainder touring Scotland. An original design was bought for £50,000 by businessman Garreth Wood, raising the highest individual amount. About 20,000 people visited a "farewell exhibition" of the sculptures in Dundee at the weekend. The statues were displayed for 10 weeks before being auctioned to raise funds for the Archie Foundation's Tayside Children's Hospital Appeal. They included a Tim Peake-inspired "Astro Wullie", which raised £12,000, a design commemorating David Bowie, which went under the hammer for £19,000 and a design inspired by computer game Minecraft which fetched £34,000. Tangerine Terror, a sculpture inspired by Dundee United FC, was bought for £16,000 by the club's chairman, Stephen Thompson. The charity's director of fundraising Cassie Thompson said the amount raised was "amazing". She said: "I can't put it into words how i feel right now. "It has exceeded our expectations so much more than I ever thought. "The generosity in the room and on the internet, I mean it just goes to show how Oor Wullie, a national iconic character, just how far-reaching it has been. The auction was held at Dundee Rep Theatre.